We have your favoritesand your soon-to-be favorites! 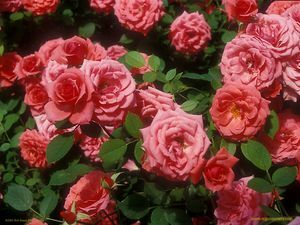 You can choose from among the more than 1000 varieties of bare root roses we offer. We have hundreds of colors, varieties and shapes of bare root roses. You can find bare root roses from all of the major growers like Certified, David Austin English Roses, Star, and Weeks Roses, and we carry bare root roses from numerous smaller growers who offer the rarer varieties. We sell over 50,000 Grade #1 roses every year. Hybrid Tea, Grandiflora, Floribunda, English Roses, three sizes of Tree roses, Climbing roses, Miniature roses, Shrub roses, and Landscape roses. Why is the grade important? Read on or see our Anatomy Guide. You get a much wider selection of roses by mail than you can find in any one nursery. We feature over 1000 varieties of roses. Get them shipped to you when you choose, as soon as your zone is frost free. Plant as early as February in some zones, allowing the roots to get well established before the growing season. Get better first-year growth and better quality roses. We almost exclusively sell Grade #1 roses that have at least three strong canes a minimum of 5/16" in diameter. Cheaper roses are almost certainly Grade 1½ and Grade 2 roses and their canes are thinner and fewer. They won't produce as much and they may not last through the next winter. We've been carrying roses since 1965. We know our stuff. Just think of us as your friend in the rose business! Don't pay extra for the dirt! Here's a secret: all roses start out as bare root roses. Don't make the mistake of waiting to buy roses in the container. You'll pay more just for the dirt! And don't be intimidated by bare root roses! Planting bare root roses is easy. Roses are our primary business during the winter season. We have become one of the largest suppliers of Grade #1 roses in North America. With our huge selection of Grade #1 roses, the variety of our selection, along with our value-priced inventory, we are your one-stop-shop for bare root roses. When you buy from us, you can be sure you get what you pay for. We believe you'll save more by buying from us than you spend on cheaper and lower grade roses. Give us a call at 510-797-3222 (8-6 Mon-Sun PST) or drop us a line.